Bantwal town is often called Vatapura Kshetra by some communities. Bantwal actual meaning is Banta Wala. Banta (Bunts) is a community. It is situated on the banks of River Nethravati on the National Highway - 73. The adjacent town of B.C. Road (Bantwal Cross Road) serves as the commercial center. Previously, the town of Bantwal was known for trade with the Persian Gulf states, being so close to Mangalore. However, flooding caused by the river Netravathi during the monsoons compelled traders and newer settlements to move to the adjacent city of B.C. Road due to its higher altitude. Gradually, most Government offices shifted to B.C. Road. Prior to 1852, Bantwal Taluk was the largest taluk in the entire of Canara Province (then comprising North Canara, Udupi, Mangalore and Kasaragod Districts) with 411 villages and a total population of 1,69,416. In 1852, a portion of it was formed into the Taluk of Puttur. Bantwal was an enterpot for the produce of the province on its way to the Mysore Country and had derived a great benefit of late years from the extension of the coffee trade. It contained about thousand scattered houses inhabited by Billava, Bunts Bhandary, Ganigas, Kulals, Goud Saraswat Brahmins, Konkani Catholics and a few Jains. 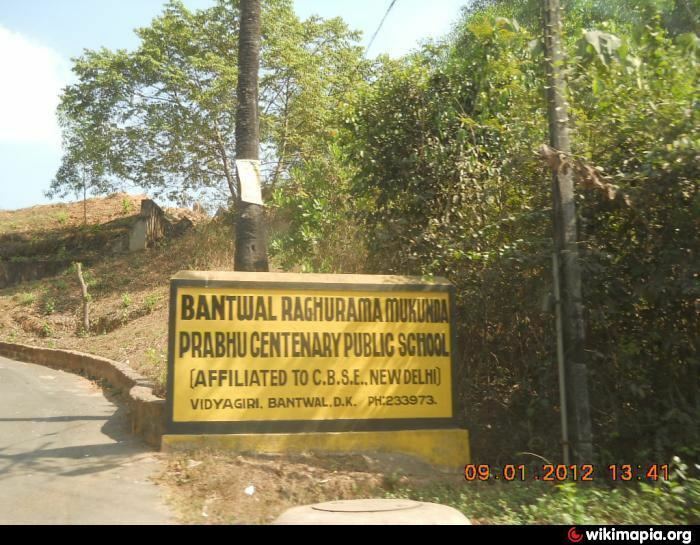 As of 2001 India census, Bantwal had a population of 36,829. Males constitute 50% of the population and females 50%. Bantwal has an average literacy rate of 74%, higher than the national average of 59.5%; with 76% of the males and 72% of females literate. 12% of the population is under 6 years of age. Tulu is the main language spoken here.In addition to tulu the town also has Konkani and Beary speaking population. According to the 2011 India census, Hindus make up 61.27% of total population, Muslims 32.47% and Christians 5.95%. The town is still considered an important trade center for groceries, tobacco, hardware and gold. The taluk is flanked by the state of Kerala in the south, and the towns of Belthangady and Puttur in the east, the city of Mangalore in the west and Karkala in the north. It covers an area of about 720 km square. National Highway 73 cuts through B. C. Road. The highway serves as the conduit for several arterial routes leading to neighboring towns with Mangalore. Mangalore is connected with other cities in Karnataka such as Mysore and Bangalore via NH-73. It is well connected to Uppala through Uppala-Mudipu-Bantwal Highway. The Grama Panchayats in Bantwal taluk are Golthamajalu, Kolnadu, Sajipa Muda, Kurnadu, Maani, Navooru, Pudu, Sangabettu, Maavinakatte, Sarapady, Thumbe, Veerakumba and Vittla (Vittal). The Netravati River passes through the taluka. Water supply to Mangalore city is provided by a vented dam at Thumbe to Netravathi. There is a bridge over the Netravati river at Panemangalore. Some other places in Bantwal taluk of interest are Kadeshivalaya, Ajilamogaru, Alike, Karanje, Naraharibetta, Nandavara and Modankap. SVS PU College, Vidyagiri, Bantwal. P.A. Fr. Gr. College, Nadupadavu, Kairangala. P A College of Engineering, Nadupadavu, Kairangala. Shri Mahalingeshwara Temple: one of the oldest temples in the region and is dedicated to Lord Shiva. Shri Tirumala Venkatramana Swamy Temple of Bantwa: a famous temple that believed that Lord Venkateshwara or Balaji came here all the way from Tirupati. Shri Vinayaka Shankaranarayana Durgamba temple at Nandavara: another historical and famous temple situated in the banks of Netravati River. Shri Mahamaya Temple: Borimar, 3.5 km from Soorkmeri and near Mani. Shri Karinjeshwara Temple, Karinje, Bantval Taluk. This temple is situated at a place called Karinja of Kavalamudur village of Bantval taluk, which is 38 km away from Mangalore and 14 km away from Bantval. The temple could be reached from (2 km) a place called Vogga on Mangalore-Belthangady route. This temple is dedicated to Lord Shiva and Parvathi. Every year in months of February — March, Shivaratri, the festival of Lord Shiva is celebrated here with much festivity, which attracts large masses of people. Shri Rajarajeswari Temple, Polali, Bantval Taluk, placed at 20 km away from the city and 20 km away from Mangalore city and 10 km away from Mangalore Airport (Bajpe Airport). This famous temple is where the idol is made up of clay. The temple festival is known as Polali Chendu. Watermelons are offered to lord as it's the common fruit grown here. Nara Hari Betta, Bantwal: This Shiva temple is also historically known as a place where Nara and Hari, incarnations of Lord Vishnu were supposed to have performed the penance. This hill top temple is also known for its lyrical ponds, which are in the shape of Shanka (Conch), Chakra (Wheel), Gadha (Heavy Weapon) and Padma (Lotus), the weapons of Vishnu. Taking a holy dip in these ponds on the day of Karthik Somvar is considered to be sacred according to the Hindu mythology. Location: It is situated 25 km from Mangalore in Bantwal. "Panolibail Kallurti Daiva Sthana" which is most famous sthana situated in few km distance from bantwal. This holy place famous for "Agelu". sri kallurti kalkuda, Annappa panjurli daivasthana Bhandary hittlu bantwala. The Most Holy Saviour Church on the hills of Agrar is three kilometers away from the town is more than three hundred years old and has got beautiful paintings on the walls similar to the ones at the St. Aloysius Chapel. Infant Jesus Church, Modankap is also a three-hundred-year-old church which is the main church of the Bantwal deanery headed by the Vicar Var. Our Lady of Loretto Church, Loretto. Church of the Sacred Heart of Jesus, Shamboor (Shambur). Infosys Campus, Kamblapadavu, Kurnad Post, Pajeeru Village, Bantwal..